Update at 11:30: The newest models just came out and are going with a general 12-15 inches of snow. Anything could change right now considering the model’s inconsistency. 6ABC news called this storm a hurricane with snow aka a snowicane! 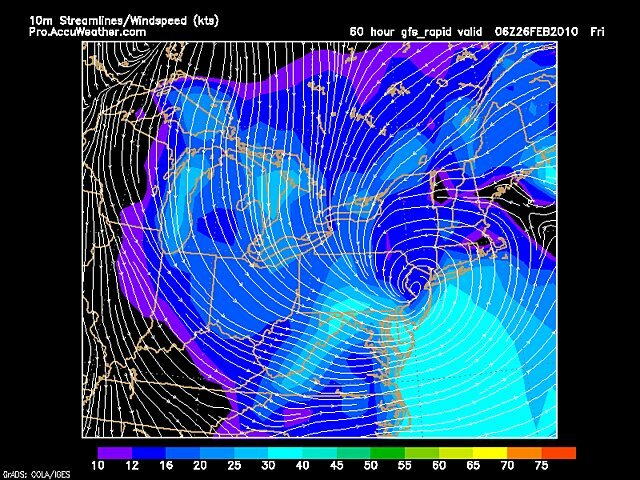 This storm is really blowing me away with its size and amount of precipitation that the models are projecting with it! Also I forgot to mention earlier that a WINTER STORM WATCH is issued for late Wednesday Night in to Friday. I would expect a WINTER STORM WARNING by tomorrow morning followed by a BLIZZARD WARNING during the storm! This storm will be big. What defines big, you ask? A low pressure with winds that are going to be sustained in the 40 mph range throughout the Philaburbia Coverage Area. This storm won’t be just gigantic, it is also going to last a very long time. It is expected to start Thursday morning (8:00 AM range?) and end by late Friday night. This will most likely be a paralyzing storm for most of the region with schools closing on Thursday and Friday and businesses shutting down. There will be many, many power outages as well because of the heavy nature of the snow; great for snowmen, but terrible for tree branches and power lines. I am not confident to post a snow map yet because the last model run wasn’t as strong with this storm. Note that this storm has a potential of being a huge bust (failure) because of the models inconsistency! This is just my opinion on what I think will happen based on the pattern of this winter. where is the snow map? okay thanks sorry to bother you, I really hope we don’t have school tomorrow but we might.